A robber has kidnapped Sam Fox and his cousin Nissa during a tropical cyclone. When the getaway car crashes into the raging Crocodile River, the children must face one ordeal after another to survive against incredible odds... This book is suitable for ages 10+. 'I didn't want to die, and I especially didn't want to be killed by a crocodile. But there was no escape.' A robber has kidnapped Sam Fox and his cousin Nissa during a tropical cyclone. When the getaway car crashes into the raging Crocodile River, Sam and Nissa must face one ordeal after another to survive against incredible odds. Sam fights to keep his head above water and Nissa out of the jaws of certain death. As the waters rise and the crocodiles close in, Sam must push himself to the limits of endurance. 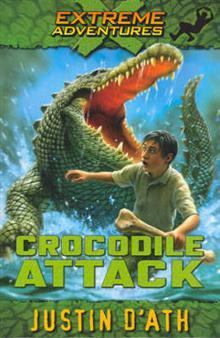 An action-packed rollercoaster ride, Crocodile Attack is the first book in a thrilling new series! Visit puffin.com.au/extreme for more.